This page has nothing to do with Cosmic Quest. I am not a fan of the Fairy-Type, in fact I despise it, so I wrote this to explain all of the conspiracies that I’ve made up about them. They appeared out of nowhere in the Kalos Region. Many Pokémon changed to join them. They are a powerful force. They have weakened the Dragon-Type. The Fairy-Type might have been the worst thing to ever happen to Pokémon, but what if there was more to their story? 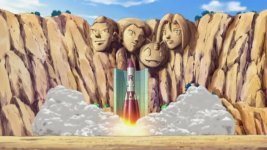 What if there is a conspiracy stretching back to the very beginning of Pokémon? Millions of people around the world know that Fairy-Type exists. What if there was more? Did Fairy-Type Pokémon help to shape our history? And if so, is it related to a greater conspiracy? Who were they? Why did they come? What did they leave behind? Where did they go? Why have they returned? June 11th, 2013; perhaps the darkest day in Pokémon history. The Fairy-Type was revealed. Not only was it announced as a new type, but that old Pokémon would also become this new type. Game Freak issued an official statement claiming that the Fairy-Type was meant to balance the overpowered Dragon-Type. It did its job too well. The Fairy-Type might have effectively weakened the Dragon-Type, but an even worse monster was created that day. But what if they weren’t actually created then? What if the evils of the Fairy-Type have existed since the time of the dinosaurs? Maybe even earlier? During the same generation as the introduction of the Fairy-Type, one of the first dinosaur-themed Pokémon was also introduced, Tyrantrum. Tyrantrum is a Dragon-Type, and when you think about it, dinosaurs are giant, reptilian monsters, so in short, dragons. So what if millions of years ago, the world of Pokémon was ruled by Dragon-Types? Mainstream scientists believe that the impact of a massive meteor caused the dinosaurs to go extinct. But if they really were Dragon-Types, the only thing that could have defeated them would have been an ice age, infighting, or fairies. What if the meteor that was believed to destroy the dinosaurs was actually carrying a colony of Fairy-Type Pokémon? These fairies would have arrived on a planet ruled by dragons. Being a natural enemy of dragons, the fairies would have set out to destroy them all. This could be the reason that the Dragon-Type is the rarest type of Pokémon in modern times. After successfully exterminating the dinosaurs, the Fairy-Type went in to hiding. Many disappeared, not to be seen again for millions of years, others disguised themselves as Normal-Type Pokémon, such as Clefairy and Jigglypuff. Over the years though, despite their hiding, there were several pieces of evidence that proved the Fairy-Type existed. 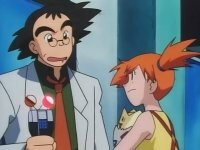 September 15, 1998; notable Pokémon trainers Ash Ketchum, Misty, and Brock meet a group of Clefairy and a scientist who has been studying them named Professor Seymour. He tells the group that these Clefairy are, in fact, from outer space. Almost a year later, on September 25, 1999, Ash and his friends meet yet another group of Clefairy, this time in Viridian City. These Clefairy have arrived on Planet Earth with the use of a UFO. This infers that reinforcements were being sent to the secret Fairy-Type army from the moon on a regular basis. These Clefairy however, had some problems with their ship, and crash landed. Studying this crash was a well-known Ufologist, Professor Oswald. The professor firmly believed that the Clefairy were in fact extra-terrestrials, and created a device to scan for them. 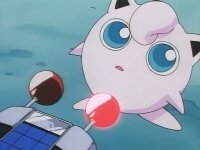 For the sake of curiosity, Oswald scans a wild Jigglypuff, causing his scanner to go off. He then turns around towards Misty and scans her, once again, causing the scanner to go off. 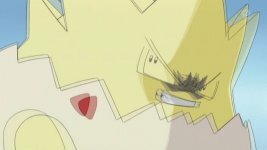 It is worth noting that Misty at the time was holding her Togepi, and that could have been what set off the scanner. It was decided that the scanner was broken, but it did say that Clefairy, Jigglypuff, and Togepi, all Normal-Types that would later become Fairy-Types, were aliens. Coincidence? I think not! Ash and friends would later encounter the exact same group of Clefairy again, except this time with the addition of a Cleffa, inferring that they too are aliens. 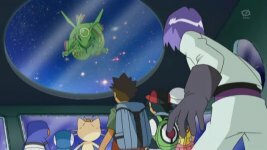 January 30, 2010; It is many years later, but Ash, Brock, and their new companion, Dawn, have another encounter with a soon to be Fairy-Type. They meet a Togepi that seems to have two completely different personalities. Sometimes it is cute and sweet, others it is pure evil. This reflects the true nature of the Fairy-Type, they look cute, but in reality it’s all an act. This Togepi proceeds to hijack a rocket ship from a group of Team Rocket grunts. A reason is never stated, but for some reason, it wants to go into outer space. It is my belief that this Togepi wanted to return home. Once the rocket makes it off Earth, it is attacked by a Rayquaza, one of the most powerful Dragon-Type Pokémon, one that has been shown before to want to protect the Earth from alien invasions. This Rayquazza attacks the rocket ship, seemingly knowing that the worst enemy to dragon-kind is commanding it. A little while later, September 4, 2010, Ash has yet another encounter with a fairy. His friend Dawn had recently acquired a Togekiss, and she wanted to have it train against Ash’s Gible. During the fight, Gible launched an unsuccessful Draco Meteor, which after missing Togekiss was sent flying at Dawn’s Piplup. 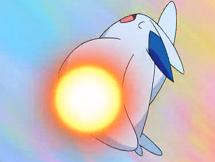 Togekiss then moves in and deflects the attack. How could a Normal/Flying Pokémon like Togekiss deflect a Draco Meteor without taking any damage whatsoever? This isn’t a Normal-Type we’re dealing with here, but a magic and sparkles Fairy-Type. Acting on its instinct to do anything to fight against dragons, Togekiss forgot about its secret agenda of hiding, and showed its true colors. Now, after possibly millions of years of waiting, the Fairy-Type has revealed itself. And it seems like it will stop at nothing less than the complete annihilation of the Dragon-Type. August 8, 2014; a cover-up by Game Freak has just been leaked. A Dragon-Type has defected. 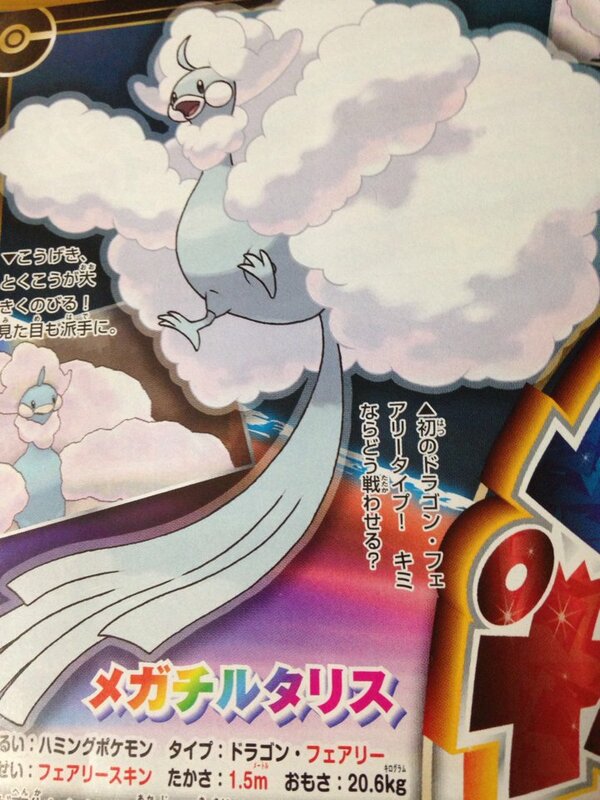 Altaria, once thought to be a loyal Dragon-Type, has just been revealed to Mega Evolve into a Dragon/Fairy Type. It would appear that Altaria has been a double agent all along. Just In: The famed International Police Officer Looker has just been discovered in Hoenn’s Battle Resort. Preliminary reports suggest that he has absolutely no memory of who he is or why he is there. The only hint of his history is a mysterious item, Audinite, the Mega Stone that causes the Normal-Type Audino to Mega Evolve into the Fairy-Type Mega Audino. It just so happens that Looker’s appearance in Hoenn coincides with the discovery of the Fairy-Type in the Hoenn Region, as well as the discovery of Mega Stones that turn non-Fairies into Fairies, such as the previously mentioned Audinite and Altarianite. It is conceivable that such Mega Stones are being created by the Fairies as a weapon to force others into their ranks. It also seems possible that the International Police became aware of this plot and sent their top agent to stop it, but the Fairies intercepted him, sinking his ship and taking his memory so that no one would know this secret. If this theory is true, then maybe Altaria isn’t a traitor after all, but a casualty of war. You know about Fairy-Types, and you know about Ancient Aliens. What if they were one and the same…? You know whats funny. I am a Dragon Type Trainer, and absolutely hated Fairy Types when they first came out, it seemed really stupid. But after getting a Gardevior in Omega Ruby and found that I love to use Fairy Types along Side Dragon Types. Though I do think they need to add light type that is Immune to Fairy Types, that way they can have a Dragon Type that is Immune to Fairy types. While my dislike of the Fairy-Type definitely started because they are super effective against Dragons, I have since developed other, less biased reasons; the primary of those being a dis-balance of the typing. Being supper effective against Dark, Fighting, and Dragon, makes them good against some of the most powerful Pokemon, while they are only bad against Poison and Steel, two fairly rare types. While I do think the Light-Type would serve to help, I’m not even sure if it would be enough. If you’re curious my other reasons are that any new ones designed (in my opinion) have awful designs and they were too inconsistent in retyping old ones, like why would the Jigglypuff and Clefairy lines be Fairies, while the Chansey line, which looks exactly the same, not be? One that I don’t get in the retype is Celebi. The Pokemon looks like a Fairy and it isn’t a Fairy Type? How does that make sense? I like the fact that Dark types have a new Weakness. The whole Bug Weakness is kind of weird. And the fact that they are Super effective on Fighting types would make sense, fighting type would have a hard time bringing itself to hitting some cute little fairy. But Fairy’s could kick the crud out of a fighting type. As for the whole types its weak to. Consider what some of the moves you could use. Iron Tail, Flash Cannon, and a great deal of others. I dont normally use Poison or Steel Pokemon. (Agaron excluded, I really like how Agaron look.) but their Attacks I use quite a bit. Sludge Bomb being one of the attacks I use for most of my Grass types that can use it. Anyway I guess you could say I am now a Dragon and Fairy type Trainer. I just wish their was a few more Dragon and Fairy Type Pokemon. Maybe even a Legendary. It would be quite interesting. Seeing as it would completely make it immune to Dragon type attacks. I do have to wonder how long they have been planing to add the Fairy type along with Mega Evolution. I have been going back through the episodes and it seems for quite awhile. I mean look at how many of Ash’s Pokemon can Mega Evolve(Once they evolve more.) He has an entire team of Mega evolving Pokemon. And I have looked at some of the Pokemon that have been retyped Fairy types and they really make sense as Fairy types. As for why Chansey isn’t. It might be the same color as some of the others. But it doesn’t really look like a Fairy. and Most of the new Fairy types can fly to an extent. Weather its through Telekinesis or through something else. The only ones I dont get are Marill’s line, Grunbull’s line, Mr. Mime’s line and Mawile(That being said I like Mawile more now being that they are Fairy types….Yea weird I know.) For ones I don’t get not becoming Fairy types: Celebi, the Lake Trio. Victini, Manaphy, Phione, Jirachi and Mew. They all seem to fit as Fairy types and yet they aren’t Especially Celebi and Jirachi, they both look like Fairys. While the Dark-Type (and admittedly Dragon as well) could have used another type to balance them, what bugs me is that they claimed they made Fairies to balance Dragon-Types, but they made another overpowered, if not more overpowered, type in the process. Dragon may have only been bad against two types, but at the same time, it was only good against a type that was also good against it causing, at least in my opinion, a balance that didn’t need to be disturbed. Celebi and those other Legendaries definitely should have been Fairy, especially Victini and the Lake Trio, but it seems they had something against changing the type of legendary Pokemon, which does make some sense. Snubull and Ganbull actually make sense once you realize that their tittle is The Fairy Pokemon. I don’t know about you, but I at least always used to group the Jigglypuff line, Clefairy Line, Chansey Line, and Audinno together as the “Fairy” Pokemon, long before the concept of the Fairy-Type existed. Personally I never used to use Steel or Poison-Type attacks, and only do now due to the threat of Fairies. And of course we all have our own opinions, and if they did make a Dragon/Fairy Legendary, I would have to come up with some new convoluted theory calling it the mastermind of this entire “war” and branding it a traitor to its kind. Not really, you could say its the reason the war started in the first place. Originally Dragon types and fairy types got along, both being mystical type-ish. But when the Dragon and Fairy Legendary Pokemon was born it caused conflicts that tore the dragons and fairy type Pokemon apart and caused them to hate each other. I didn’t know granbull was titled Fairy Pokemon…..Now it makes sense. I don’t use Steel types much, minus Dialga and Aggron. And for Poison types I really don’t use them much. But I think that was part of the point, to make people use Steel and Poison types more. I have seen a great many people that use dragon types, fire types, water types, Rock types and most other types. But Poison and Steel type trainers are few and far between. Celebi really bugged me because it is a time traveling fairy. If you look at Celebi it even looks like a fairy.It has the wings, the body style. Heck it can be taught Dazzling Gleam. Which is a Fairy type move. Its the only fairy type move it learns though. I’m going to need some evidence first. Prove to me that Fairies may not be evil, and then we’ll talk. Well for that to happen, we’ll need to go to Entralink (in Unova), a Musharna, Dr. Fennel, a Fairy-Type, some Dream Mist, a Choice Scarf Togiekiss, P-Diddy, Duct Tape, Escape Rope, and some White Citrus Lotion (found/made only in White Forest in Unova). We will prove it to you, and then we head to PIP Headquarters. Honestly, I like the way you give it an Ancient Aliens Feel to it. I watch that Series on History Channel. But, for a game designer perspective, we have to consider the real life lore at times. If memory recalls, fairies in ancient lore in real life are often depicted being very sensitive to steel and poison as they are nature dwellers and lovers. Warriors and their steel armor, add along the blessings of mythical fairies, are what made real life swordsmen in ancient Europe very popular to slay the dragons. But for me, they should had been neutral to dark types at least due to their affinity with the moon. Fighting they resist is fine. I mean, most fairies often looking nice and adorable, with a few filled with innocent or not-so-innocent mischief. What got me curious is how much would the fairy type shook the balance of the types if Fairies only resist dragon type attacks instead of being immune to dragons? That is my question to the writer. In all honesty, this article wasn’t meant to be taken seriously in the slightest. I’m just a giant fan of Dragon-Types (if you’ve read Cosmic Quest, the character Ryu is me making fun of myself), so of course I’m going to be upset about the Fairy-Type no matter how balanced/unbalanced it is.You probably are right that they would be mostly irrelevant if they weren’t immune to Dragon-Type attacks. However, with that being said, I think there should have been a better balancing done with them. Steel and Poison-Types are just too rare to use, at least the way I see things. To be honest I love fairy types and dragon types. But I think faries would probaley not go looking for a fight. At least mabye… Good idea though! Ok if aliens do actually appear in Cosmic Quest it’s going to be like the first contact senario or the alien invasion senario. I hope Ash gets to fight some aliens then he’ll be in same league in saving the world from Intergalactic threats just like Sonic The Hedgehog. But aliens already have appeared. What do you think Eatyai and Yuifoe are? Yuifoe could be an alien, but if Elgygem and Beeheeyem aren’t aliens, them why should their evolution be?